Yesterday I went on Raptr for the first time in ages. I felt like I’d been neglecting the service and I do like it, so I did some spring cleaning and then discovered my unread gaming report for 2013. It was an interesting read, and several points from it really stuck out for me. I also played a lot on Paul and mine’s Wii U and I’ve also now got a 3DS, plus a PlayStaion 3. And if I estimate about 50 hours for the Wii U games that I played, 25 hours for what I played on PlayStation 3 over Christmas, and more accurately 106 hours for what I played on my 3DS: I played for around 425 hours in total during 2013. However, that’s still down on 2012, which saw me play for at least 555 hours of games compared to 2013’s approximate 425. 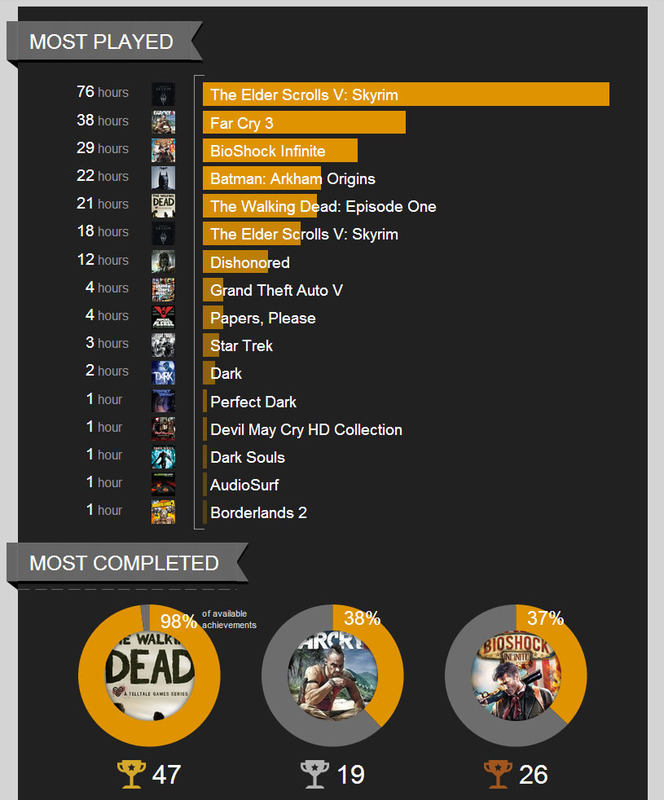 The total number of different games I played during 2013 was definitely down on 2012. As other entertainment products vied for my attention during my free-time: comics, TV shows and novels – I played fewer games. Even if I add the 2 games I played on PS3 (Beyond: Two Souls, The Last of Us), the 3 I played on Wii U (ZombiU, Splinter Cell: Blacklist, Monster Hunter 3 Ultimate), and the 4 on 3DS (Animal Crossing: New Leaf, Luigi’s Mansion: Dark Moon, Fire Emblem: Awakening, Pokémon X) – 9 games: I’m still down on the variety front. I played 28 different games in 2013 , compared to 2012’s 39. And it wasn’t like there were less games out last year. But I definitely didn’t buy as many games last year or replay as many of my existing collection. I definitely felt disinclined to go back to older games. I remember free evenings where I was like, “I want to play something, but I’ve got some things I really want to replay, but I’ve got several games I haven’t played before…” And because I couldn’t resolve the potential feeling of guilt of going back to the same old, I’d just go and do something else. On the buying front, I don’t see things changing much this year. No games on the release horizon have really stoked my interest. Apart from finally playing through all of Final Fantasy XIII-2, completing The Last of Us and DMC, and playing Luftrausers for review, I’ve mostly been playing Skyrim this year, but on PC. I’ve been making a point of doing quests I haven’t done before (including DLC) and generally just messing about. 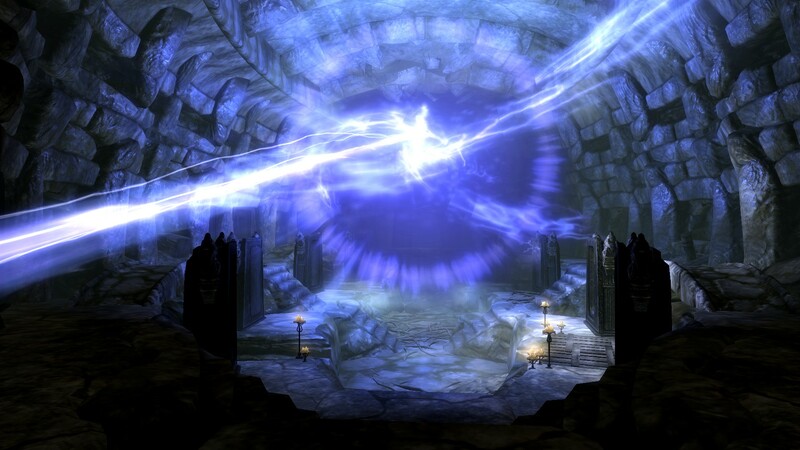 Due to various things going on in my everyday life at the moment, I think that Skyrim is being a comfort game for me at the moment, mostly because I know what I’m getting with it. Which is funny, because once upon a time, the Skyrim‘s bugs use to drive me absolutely crazy. Though I will be returning to Alan Wake this week in attempt to take part in Johnny Cullen’s Game Club. Like I said earlier, there’s no releases for this year that I am particularly excited about. Not that I am eager to spend my money on games, but due to shrinking free-time I do feel disinclined to go towards new titles I don’t have much guarantee for in enjoying. This is something I discussed in episode 81 of Nerds Assemble. 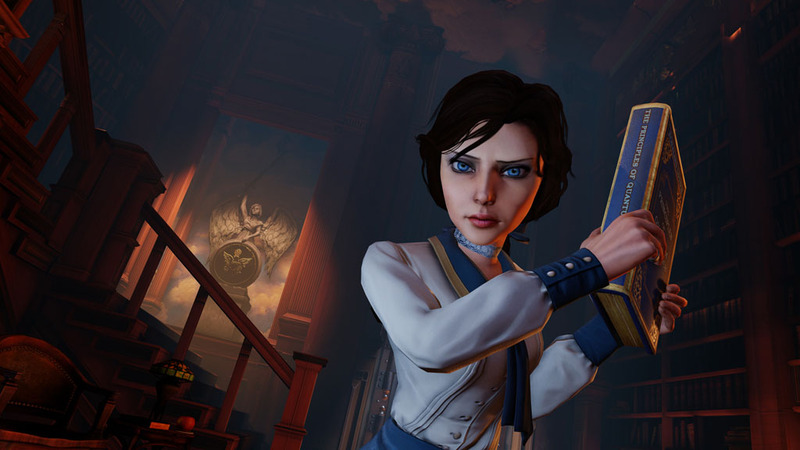 If you can think of any games I might get excited for that aren’t coming out on PS4 or Xbox One only – let me know. I can’t play Skyrim forever.